One of the most exciting features of the ZI-808 is its built-in web server. Its user interface is designed like a standard web page and embedded into the instrument. That means that any device that can open a web page can use it. Desktop, laptop, tablet, smart phone, Android, Windows, iOS, Linux, Edge, IE, Chrome, Firefox. All are compatible with the ZI-808. While using the ZI-808 on a local area network is nice, there may come a time when you’d like to access it from home or literally any other location on the planet via the Internet. This application note explains how that is accomplished. It’s designed to provide a clear understanding of rudimentary principles and background information for the networking novice. Your network administrator will know how to implement these strategies to make remote access a reality for your application. Conventional networks are controlled by a router, which usually divides access into a public and a private side. On the private side of the network live all your devices: laptops, printers, desktop PCs, and even smart phones. The router maintains order on the private side so that all these devices work together. You can access servers and print documents to your printer with complete transparency. Your ZI-808 also lives here and you can access it from any device with a web browser from the private side of the router, which is probably how you’ve used it so far. On the public side of most routers is the Internet. Just like the router maintains order on the network’s private side, it also manages device access to the public (Internet) side. When you surf to a url like www.yahoo.com from the private side of the router using a smart device, the router manages access to its public side so you get what you want. All of this is wonderfully transparent, and a great testimony to the flexibility and power of the router. The router manages all this activity through the use of IP (Internet Protocol) addresses. On its private side it assigns each device a unique IP address, so traffic to and from various devices occurs seamlessly and without conflict. On the Internet (public) side of the router it uses just a single IP address that is assigned to it by your Internet service provider (ISP.) IP addresses on the public and private sides can be, and usually are, entirely different. And just like on the private side of the router where each IP address is unique, so are IP addresses on the public side. No other device exposed to the Internet has the same IP address as your router. Let’s assume that the router assigned your ZI-808 the IP address 192.168.0.54 on its private side, and the ISP assigned an IP address of 45.75.25.128 to the router on its public side. Each IP address, public and private, has access to 65,536 ports. Think of a port as a conduit through which information flows, and each has a unique numeric identifier (0-65,535.) In a more colloquial sense you can think of a device’s IP address as the street address of a massive apartment complex, and individual suite numbers as ports. No communication occurs between the public and private side of a router without moving through a port. Some ports are reserved for a specific purpose. For example, port 443 is reserved for Hypertext Transfer Protocol (https), the language of many web pages. When you surf to www.yahoo.com, port 443 is opened on the public side of the router to move that page’s content to your device on the private side. There are many other reserved and unreserved ports on the public side of the router, and a complete list can be found here. So, how can you access your ZI-808 on the private side of the router from the public (Internet) side? You choose a port number that is either unassigned or unused, and forward it to the instrument from the public side. Let’s say we’ll use port number 8080 for that purpose. The router is configured so that IP address 45.75.25.128:8080 (from the public or Internet side of he router) is routed to the ZI-808 at its private address 192.168.0.54. Note the addition of the colon and port number to the public IP address. 45.75.25.128:8080 tells the router to forward the information accessing that unique port to the ZI-808. So far we’ve programmed the router to forward traffic on its public side entering through port 8080 to the ZI-808 on IP address 192.168.0.54 on its private side. However, remember that all IP addresses support 65,536 ports. This is true even for the ZI-808’s IP address. So the last thing we need to do is tell the router which port on the ZI-808’s IP address should receive the traffic. This additional step is called port translation, and it just means that an internal redirect takes place between traffic entering from the public side on port 8080 to a specific port on the ZI-808’s IP address. 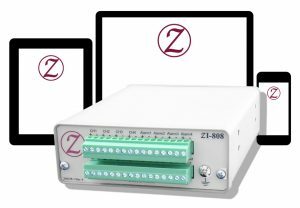 The ZI-808 uses port 80, which is reserved for Hypertext Transfer Protocol (http), so we need to instruct the router to translate traffic entering from its public side via port 8080, to the ZI-808’s IP address, port 80. After making these adjustments your ZI-808 is accessible from any location on Earth that has Internet access. All I’ve done in this application note is explain the mechanics of remote access so a novice understands what’s happening and why. The actual implementation of this process should be done by a network administrator who’s familiar with your particular router. Since all routers are different, it isn’t practical to explain how these adjustments are made in your particular situation. However, your network administrator understands them well and can made the required adjustments in a couple of minutes. Source: Using the 808 over the Internet.